This April marks the third annual Starbucks Global Month of Service. 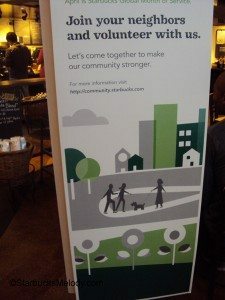 It’s a time when Starbucks does all that it can to facilitate getting both partners and customers involved in local community service projects. This year, Starbucks is facilitating a number of smaller events rather than one or two huge marquee events. The last big community service event that I wrote about was the Fourth of July clean up in Seattle – picking up litter on July 5th! 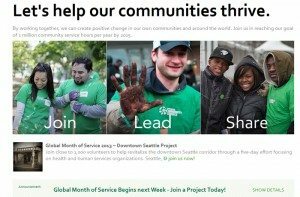 What’s particularly interesting is that Starbucks has partnered with other companies to magnify the number of hours given to community service this month. 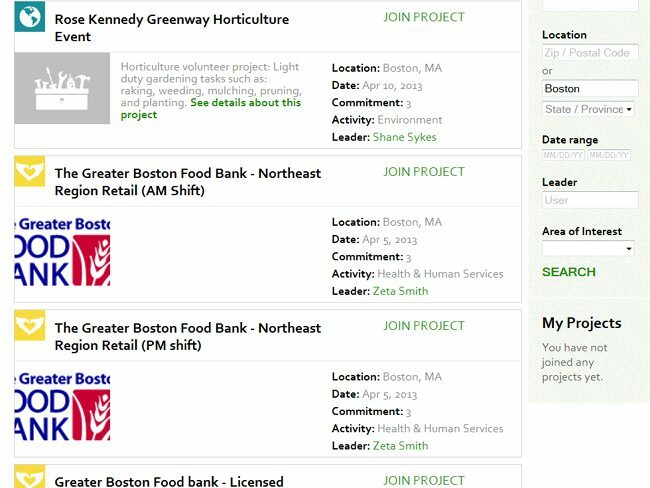 For example, in Boston there are events coming up quickly this week for the Greater Boston Foodbank, and Starbucks partners will be volunteering side by side with Fidelity Investment employees. Those events are this week! Hopefully you can still get involved. In San Francisco, there are projects planned in partnership with Square employees. And in Chicago, Deloitte employees with volunteer with Starbucks partners on local community service projects. 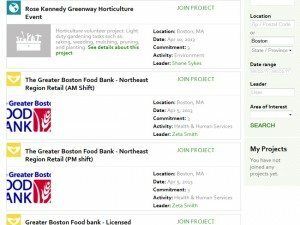 Anyone can create a profile, and use the Starbucks Community Service website, so I hope you will join in! I haven’t figured out yet what I’ll be doing. Don’t be surprised to find me weeding and mulching one Saturday with Starbucks partners. According to the Starbucks press release, there are more than 2,700 projects across 40 countries. Now that’s amazing! The bottom line is that I hope you’ll find a way to join in. Hopefully you can find a project near you! Melody funny you should post this today as I was sitting at my local SB this am and was right near the display as you showed it in the post. I was wondering why each store does not post on their community bulletin board the events they will be involved in so customers can join in? I know about the website but this might be another avenue where customers can join in. I also know from last year when I asked about what events my local SB was doing the SM said it was for partners only. I think it had to do with the organization they were volunteering at but am not sure. Each store should have a poster up for their own community service on the community board. Ii posted mine yesterday for our customers to see and join in. Keri is right, there definitely was signage sent to every store to post on their community board. Maybe your local store hasn’t finalized the details yet and so haven’t posted the information? Melody I also like that SB is doing smaller projects and it seems this year they have expanded out for sure. This will be my third beach cleanup in Dana Point with Starbucks. It is a great event and there is always a big turnout. Lots of partners bring family and friends and we end the project with a group photo and barbecue. It was a nice opportunity to get to know my manager and his children…we laughed so much! I encourage everyone to join in somewhere! I have three events this month! I am the leader of two of them, and the third is our big Toronto event that I’m going to attend. The first is this weekend and is an event for our Area. I’m currently trying to figure out what to take for breakfast for the volunteers and we’re providing coffee for the BBQ afterwards too. This is a huge project that we’ll be a part of, so there will be lots of people for us to connect with! This month is going to be soooo busy!!!! We have so many events going on in the Dallas area! I’m gonna do two food bank sessions, a lake clean up, and a bigger event with a park where we’re planting flowers and picking up weeds. It’s gonna be a blast. Make sure to post pics of any events you participate in! I like to see if I recognize anyone from my last trip up there! Hey Melody, for those in the Seattle area there are tons of project options on multiple days at multiple time slots, all based in the Downtown Seattle corridor. My partners and I will be working at the YWCA to “purge and sort” donated clothes for their annual fashion fundraiser. The group sizes vary from 5 people to 50. A few of the many options are hosting a Bingo game, yard work, making and providing meals for kids, teenagers or adults. It’s always special when partners get to work side by side with our customers to make our Hometown a little bit better for those in need. Thanks for posting!! Stacy – Thank you for your comment! I love the idea of “purge and sorting” donated clothes. Honestly, that sound like fun work, and for a great cause. I still have to get signed up for something – must do that today!